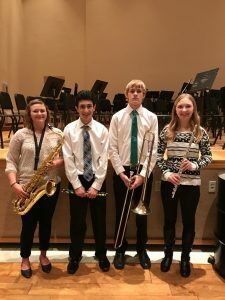 Six talented L-S High School students were invited to participate in two college honor bands in January. The first festival, the Simpson College Honor Band, was held Thursday, Jan. 19. Based upon director nominations, two L-S students were selected: Garret Cross (tenor saxophone) and Jarred Bassett (baritone saxophone). The Simpson Honor Band included a full day of rehearsals in Indianola with their conductor, Simpson College Director of Bands Dr. Mike Eckerty. The concert that evening included a performance by the Simpson College Symphonic Band. 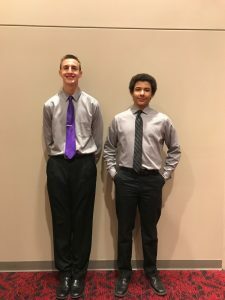 sophomore Garret Cross (tenor saxophone) and junior Jarred Bassett (baritone saxophone) performed in the Simpson College Honor Band Jan. 19. The second of the honor bands was the Central College Bandfest held on Thursday, Jan. 26. Students were once again nominated by their band directors, and four students represented Lynnville-Sully: Maren Egging (flute), Kristine Jeannette (tenor saxophone), Josh Dunsbergen (trombone), and Luke Jones (percussion). Central's day-long festival included rehearsals, as well as the opportunity to watch a recital by Central College students. The day concluded with an evening concert, directed by Central Band Director Mr. Mitchell Lutch. The high school honor band also had the opportunity to perform one piece of music with the Central College Wind Ensemble. allow these young musicians the challenge of learning difficult music in a short amount of time, and then the experience of performing that music with other talented high school students from across the state. Congratulations to all of the students involved in honor bands this year!” said Mr. Ryan McNulty, Lynnville-Sully band instructor. L-S musicians at the Central College Honor Band on Jan. 26: Left to right, senior Kristine Jaennette (tenor saxophone), senior Luke Jones (percussion), junior Josh Dunsbergen (trombone), and freshman Maren Egging (flute).